A somewhat heavy-handed plot and some unfortunate ethnic representations cheapen this rather slight early effort from Douglas Fairbanks. We see little of his physicality and exuberance in this film, although he does manage to represent an optimistic view of Americans, as usual. 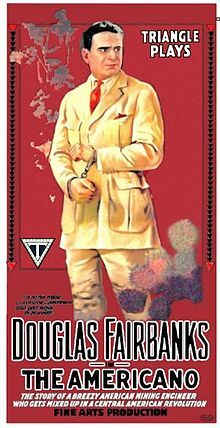 The movie begins in the tiny Central American nation of “Paragonia,” where an uneasy truce between a popular civilian government and a corrupt military is endangered when the Minister of War (Carl Stockdale) opposes renewing a contract with an American mining company that provides work for most of the population. The Presidente (Spottiswoode Aitken) pushes the motion through, and sends a cable to the US, requesting an American mining engineer be sent to help them oversee the complex machinery. At the same time, the Premier (Tote du Crow) and the President’s daughter Juana (Alma Rubens) head to the USA for a visit. The mining school has selected Douglas Fairbanks, of course, as the best man for the job, but he’s not interested in relocating – at least until he gets a look at Juana. Back at home, the coup d’etat has been effected and the Minister of War is in power. The Paragonians return home quickly, leaving word for Doug to stay behind, but of course that wouldn’t be right, so he takes the next boat. Wee are a poor peeepol Senor. On arrival in Paragonia, Doug finds that no one wants to talk about the President, the mining offices have been ransacked, and the only American left is a demeaning caricature in blackface, played by Tom Wilson. He does manage to contact the Premier, who’s in disguise as a street vendor, and to scout out the prison where the President is being held. Juana is being forced to marry the unsavory colonel Garagas (Charles Stevens), on threat of her father’s life, and the Minister of War is now splitting the army’s payroll between himself and Garagas. Doug finds that the President has been throwing papers out his window with the date November 23, 1899, and he looks in the old man’s journal to find out what happened on that day. Turns out that there was a jailbreak using a secret tunnel that has since been walled up, and that the old man is in the very cell that tunnel leads to! So, Doug organizes a hasty breakout with “Whitey” and the premier. Along the way, he is arrested by soldiers and taken to meet the Minister of War and Garagas. They try to bribe him with 1/3 of the army money to re-open the mines for them, forestalling a popular revolt. Doug takes the money and pretends to go along with them, then knocks out the soldier sent to spy on him and re-joins his friends and the mouth of the tunnel. The party makes its way through the tunnel and Doug starts chipping away at the wall with a hammer and chisel. The President, realizing what must be up, starts pounding on his cane to cover the noise, but a guard sees the tip of Doug’s chisel penetrate the wall. He holds the President at gunpoint and moves to nab whoever comes in that way. Looking through the hole he’s made, Doug figures this out and tosses the captured soldier in ahead of himself, then grabs the guard from behind. Now they make their way back to the capital, using captured guns to threaten their way into the palace, where Juana’s wedding is to take place after a speech by the Minister of War. He’s trying to placate the people, who have been told that the “Americano” is now working with him and will re-open the mine. Doug joins him on the balcony and exposes the plot. When the Minister tries to get the army to join him, saying that Doug has stolen their pay, Doug returns it, explaining that the Minister was the thief all along. The Presidente is re-instated, the mine is opened, and Doug and Juana get married (Doug now appointed the new head of the army of Paragonia). This movie is a pretty clear argument in favor of American imperialism and the Monroe Doctrine, and it gets its facts a little confused, as far as governmental instability in Latin America at the time. It’s unlikely that a coup against a popular government would be held to oppose American economic interests, usually it was the other way around. And it’s unlikely that the people would be cheering for “the Americano” to come save them. But, for the purposes of a Hollywood fantasy supervised by notorious racist D.W. Griffith, that’s pretty much par for the course. I still find Fairbanks’s “all-American” hero character charming, and reminiscent of the all-American optimist that Harold Lloyd would soon bring to life in his “glasses” character, although he’s certainly not as funny here. I was disappointed that he didn’t perform more stunts in this one. All we see him do is scale a wall to get in and out of Juana’s house, leap down some rocks by the beach, and beat up a soldier or two. Other than that, he spends a lot of the time talking to people and chiseling at a wall. There is a heavy use of close-ups, particularly of Fairbanks, suggesting that the producers thought that his face was a major selling-point of the film. 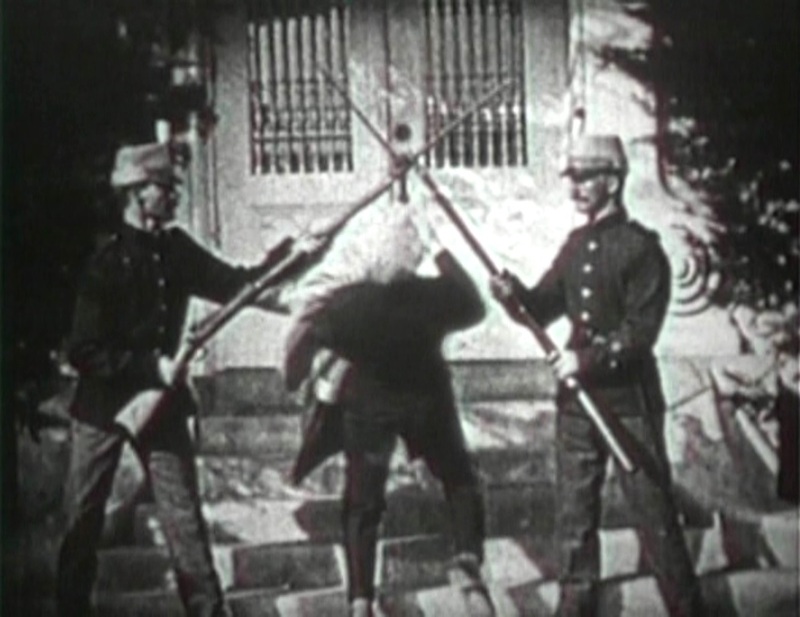 There’s one interestingly shot/edited section where Fairbanks tries to bluff his way past the guards at Juana’s house: they cross their bayonets to block him and he moves back and forth between single-shots of each of them as he tries to fast-talk them, ending up in alone in a shot with the tips of their bayonets behind him. Other than that, it’s a pretty middling production overall. I have not found this movie available for free online; if you do, please comment. 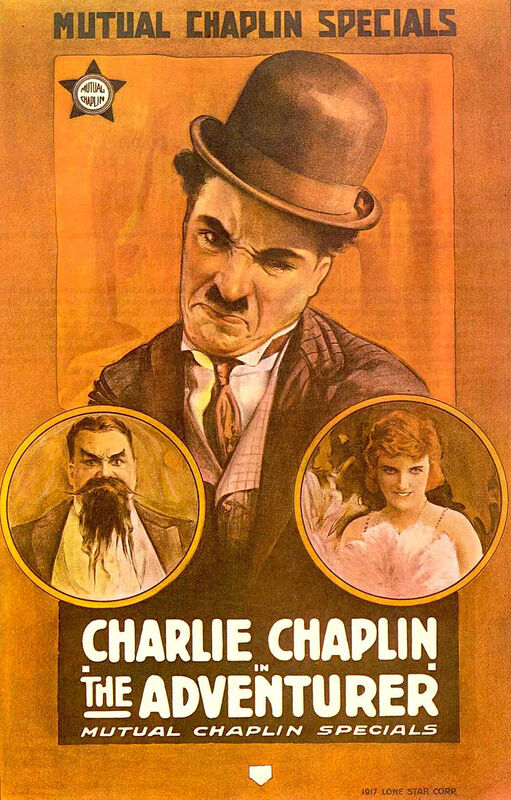 I’m beginning the year 2017 with a review of the last movie Charlie Chaplin made in 1917, one of the funniest and most accessible of his work for Mutual Film Corporation. 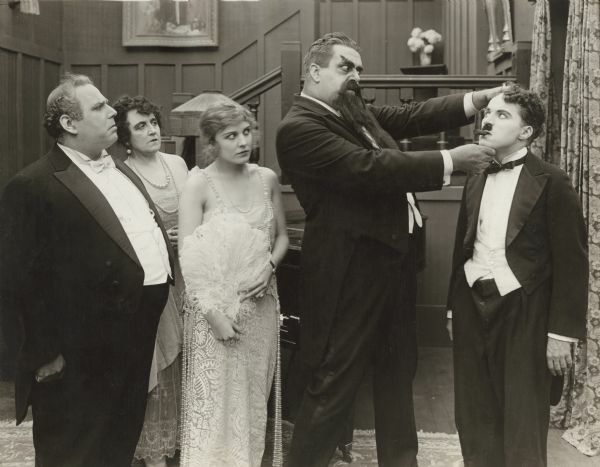 Chaplin finally finished out his record-breaking $670,000 contract with them when this film was released, and he turned down an offer of a million to renew, choosing instead to remain independent. This film was the first new Chaplin audiences had seen in four months, and by the time it came out he was one of the most famous men in the world. 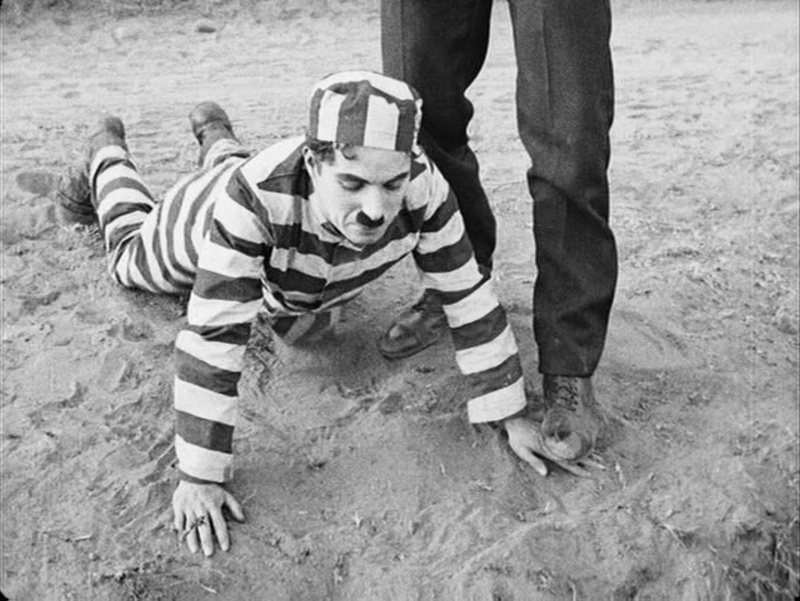 The movie begins with escaped-convict Charlie pursued by prison guards who could be Keystone Kops from his earliest days in cinema. He emerges from his escape tunnel on the beach to find himself next to a cop’s shotgun, and the chase is on. He quickly scoots up a cliff and drops rocks on his first pursuer, only to find one of the rocks is the shoe of another guard, with the guard still in it! Not one to complain, Charlie hurls the one guard down after the other. After several more clever incidents, Charlie winds up swimming into the ocean to escape. When the police try to follow in a rowboat, they are swamped by the waves. 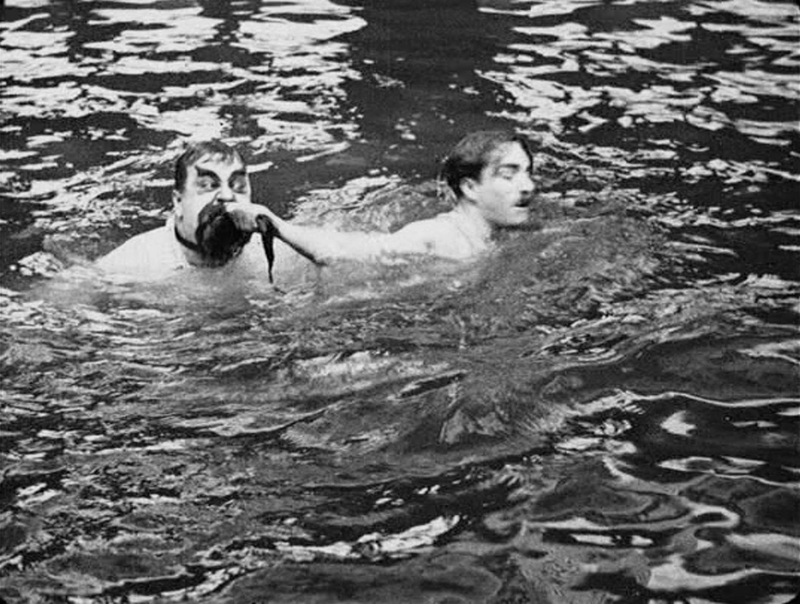 Charlie is able to get some clothes off of a bather at a nearby resort, and while he is swimming in encounters Edna Purviance’s mother drowning at the dock. Edna is nearby, at a dockside table with her suitor, Eric Campbell, and he at first boasts that he will jump in to save mother, but as he begins to strip off his clothes, it appears to occur to him that the water is cold, so she jumps in instead. Shortly thereafter, Eric and a hefty dockworker lean on the railing, causing it to collapse, and they fall in as well. Charlie manages to save all of them, although not without dumping Eric into the drink one more time for good measure, and he is taken home along with them in a limousine. The next morning, Charlie wakes up and thinks he might be back in jail. There are bars on the bed and stripes on his pajamas. But, the butler (Albert Austin) comes in and assures him he’s in the home of Edna and her parents, and Charlie soon comes down in suitably ill-fitting clothes to join what seems to be a perpetual cocktail party going on at the mansion. He grabs a bottle and mixes seltzer in for a big gulp. He and Eric exchange kicks in the rear, though Charlie always gets one up. Eric recognizes Charlie’s mugshot in the paper and tries to inform the hosts, but Charlie sketches Eric’s beard onto the photograph. In one famous bit, Charlie drops ice cream down his pants, and shakes in out of his trouser leg onto the back of a large, dignified woman below the balcony he’s on. All good things must come to an end, and Charlie’s end is precipitated by the usual conceit of the scullion maid entertaining a cop (in this case a prison guard) in the kitchen. At first, Charlie thinks he will catch her in the act, but winds up being pursued himself. Eric calls in reinforcements, and soon Charlie is being chased all over the mansion, occasionally stopping to kiss Edna farewell. He disguises himself as a lamp and traps Eric in a sliding door in a wonderful chase sequence. Each time he gets ready to leave, another pursuer shows up and chases him back inside. Caught at least by the chief guard, he introduces him to Edna, and runs off to escape when the guard offers his hand to shake. This movie demonstrates considerable sophistication and pathos, even though it is in essence nothing more than a couple of chase scenes with material from “The Count,” “Caught in a Cabaret,” and other Tramp-amongst-the-rich shorts thrown in. 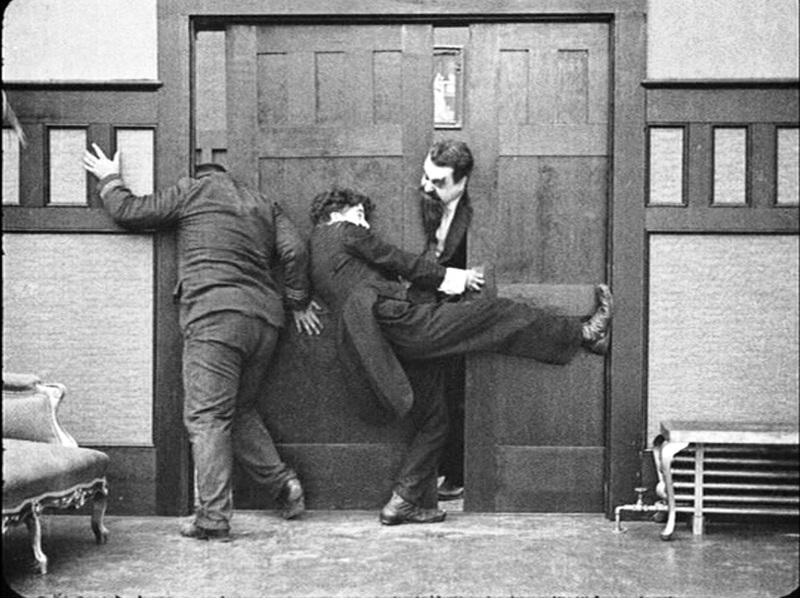 Part of it is that Chaplin has now rehearsed some of these bits to perfection – the scene in the kitchen with the maid hiding the guard is a great extension of the same scene in “The Count,” for example. But, Chaplin is also a much more confident director, with more of the tools of cinematic storytelling at his disposal as well. The camera angles and cuts that let us experience his realization that he is in danger both emerging from the tunnel and when throwing rocks from the cliff would never have been seen in a 1914 Keystone movie, and so those gags couldn’t have worked, or not nearly so well. Rarely if ever is the screen set up as a proscenium arch, the camera moves to accentuate the action and hides information from the audience until ready for a punch line. Cross-cutting sets up more complex relationships between actors in different areas than the old throw-the-rock-at-the-next-setup routine he was doing just a few years ago. Close-ups allow us to see the funny reactions of Charlie and of the often embarrassed and/or shocked rich people at the party. This is one of the best examples of why Chaplin-itis became such a epidemic in the teens, and for those who haven’t seen any of his short subjects before, I can’t think of a better place to start. 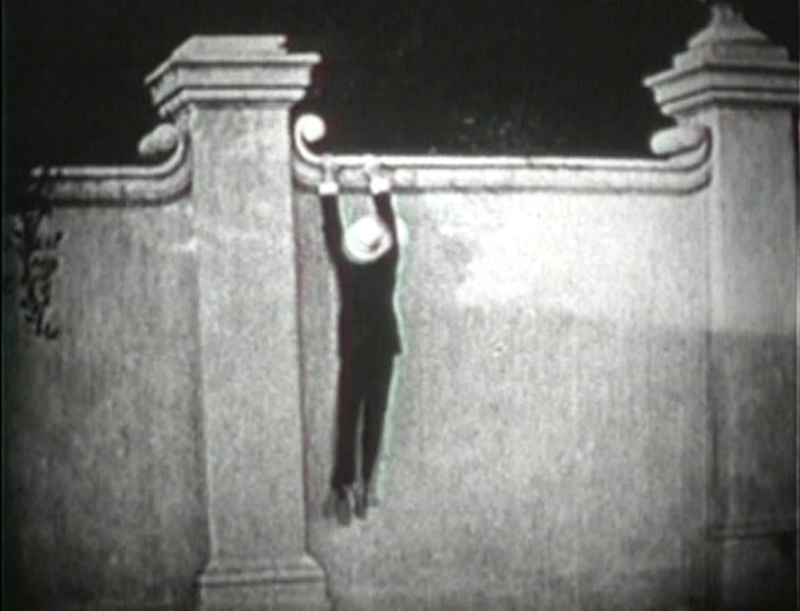 This short trick film from Georges Méliès is an early example of slapstick, incorporating elements of circus performances into a short comedy routine. 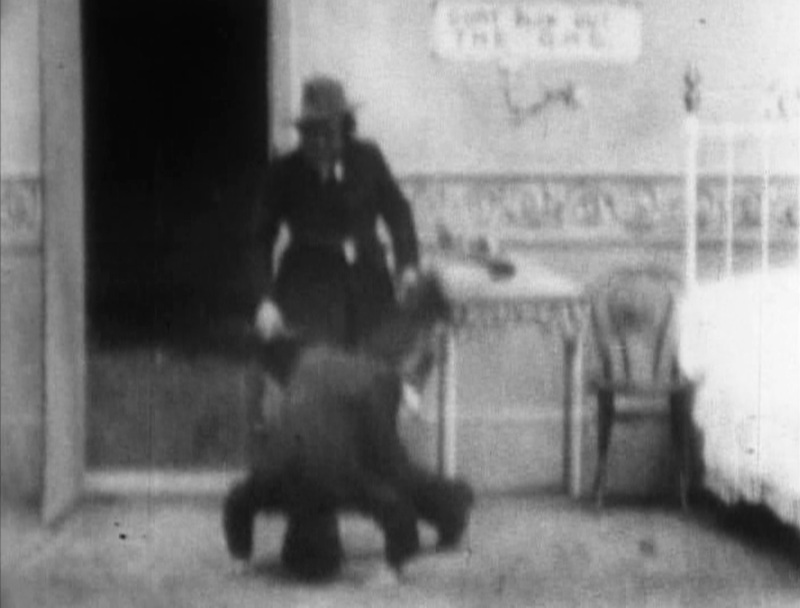 Although slapstick had been done before on film, especially with Edison’s release of “Robetta and Doretto,” this is one of the most violent of Méliès’s early films. The movie starts with a clown building a mannequin by placing a torso onto a pair of legs, then a head and finally a pair of arms. The clown and mannequin are on a small set with a medieval theme, and there is a stool with a crossbow leaning against it to the left of the screen. The clown takes a round object (possibly a head of lettuce) from the stool and places it on top of the mannequin’s head, then goes back to get his crossbow. Suddenly, the mannequin comes to life and hurls the lettuce at the clown from behind. The clown jumps up and runs over to the mannequin, which has become inanimate again, and pulls off an arm, inspecting it and placing it back onto the mannequin. When he turns around to pick up the crossbow, the mannequin again comes to life and smacks him. This time the clown takes off the mannequin’s head and kicks it then puts it back on the mannequin, which immediately comes to life and grabs the clown, throttling him and tossing him about (the clown is now an inanimate doll, while the mannequin is played by a person). After stomping on the husk of the clown, the mannequin-figure runs out a door. The clown gets back up and picks up his crossbow, with the film ending with him in mid-motion. Starring: Unknown (possibly Georges Méliès). 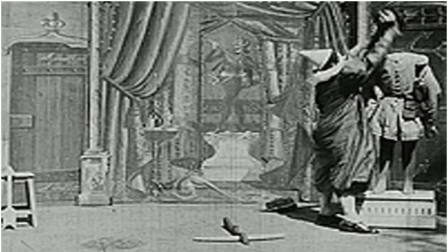 This early short from Edison Studios is another early comedy from Edwin S. Porter, but it draws heavily from another of the icons of early film: Georges Méliès. It’s something of a remake, or maybe a parody, of his movie, “The Bewitched Inn,” only with a surprise punchline at the end. We see a set dressed as a hotel room with a sign reading “Don’t Blow Out the Gas.” A man is shown into the room by a boy in a bellhop’s uniform, but instead of caging for a tip, the boy does a somersault. Partway through the stunt, he vanishes! 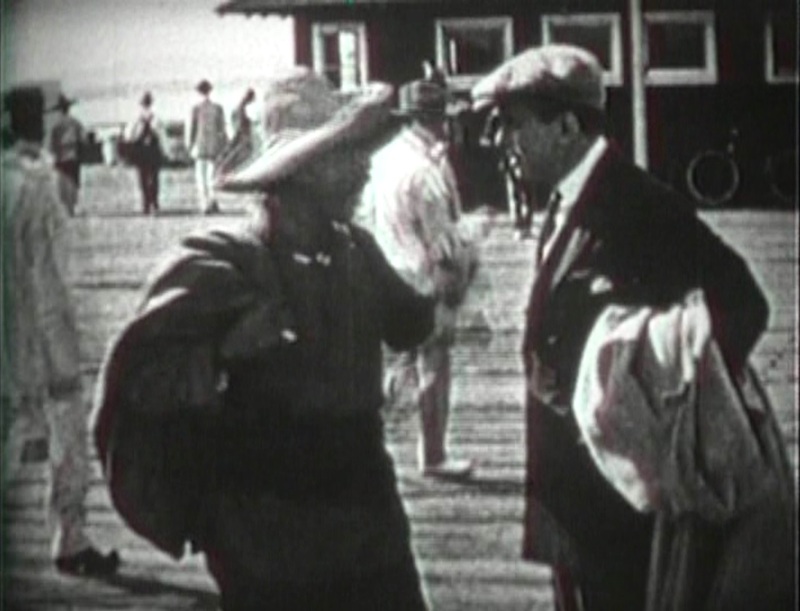 The man looks confused, but he begins arranging his hat and coat and umbrella, each of which disappears when he puts it down. He takes off his boots and they proceed to walk away from him, disappearing when he tries to grab them. He finishes preparing for bed and climbs in. Suddenly the film cuts to an image of a hearse in a funeral procession. In traditional film histories, Porter is often given credit for “inventing” parallel editing. Whether that’s strictly true or not, he definitely was among the early experimenters in creating meaning by juxtaposing film of different scenes, and the ending of this film appears to be one of the earliest examples. If the imdb version of the Edison Catalog entry for this film is accurate, the audience is to understand that he has blown out the gas and thereby caused his death. It’s a fairly clunky edit, and ending, but that’s to be expected in an early experiment. Otherwise, the movie closely parallels its apparent source, “The Bewitched Inn,” except that the effects aren’t as good and the physical performance is less amusing. I still think it might be a kind of spoof, in that Porter seems to be using the audience’s expectations that it will follow the same storyline as a deliberate misdirection to make the ending more effective. It’s worth noting that Méliès himself remade this movie repeatedly, including in the 1903 film “The Inn Where No Man Rests,” and that many of his trick films dealt with much the same theme of a person in a room having objects suddenly disappear or appear. In the early days of cinema everyone remade each other’s successful movies, so it’s not really fair to accuse Edison or Porter of being unoriginal, but this doesn’t quite stand up to Méliès’s version.